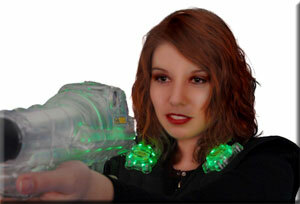 We offer the coolest, most hi-tech game of laser tag available in the Cleveland area! In addition to our multilevel laser tag arena, you can play air hockey, or enjoy one of our many arcade adventures including shooting games, dance machines, driving adventures, and much, much more. You can also just come and hang out in our expansive, fun center while enjoying music and the company of your friends and family. You can watch our large plasma scoreboards and follow the play-by-play action as it unfolds in our huge laser tag arena. We proudly serve delicious pizza, snacks and Pepsi products if you are hungry. We offer free high speed Internet so parents can work or surf while hanging out with the kids! For more information, give us a call with all your questions about Laser Xtreme Family Fun Center, Laser Tag, Birthday Parties or anything else we can help you with!